Whew, it took a while to master these photos. Finally it's finished, a monumental weight has been lifted from my shoulders. I know Adepticon is still a month away but I have many projects, well basically I'm going to be painting as many as I can before the con, and having this one finished leaves me a decent amount of time to finish some pieces. If you happen to be in the combat patrol tournament, look out for these bad boys. and Jetbikers. 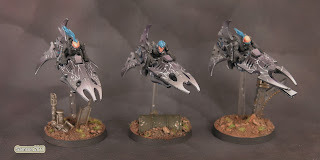 We used the dark eldar bikes and underslung the Eldar weaponry. Nothing too fancy but it's effective. Converting Eldar to represent Eldar wasn't that hard. To break things up a bit during long painting sessions I worked on Lelith Hesperax to sell on E-bay. It's hard to part with this model, I'm very happy with the way she came out. Hopefully she goes to a good home. I've been a little quiet lately on the blogging front due to the project, next to my real life, that has been consuming my time for the last week and beyond. I'm happy to say though that after tonight I should have it finished. This leaves me with a decent amount of time to paint more entries for Adepticon which of course has me feeling good. 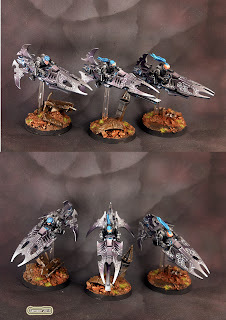 Here's a squad of jetbikes that may be skimming by the combat patrol tournament. 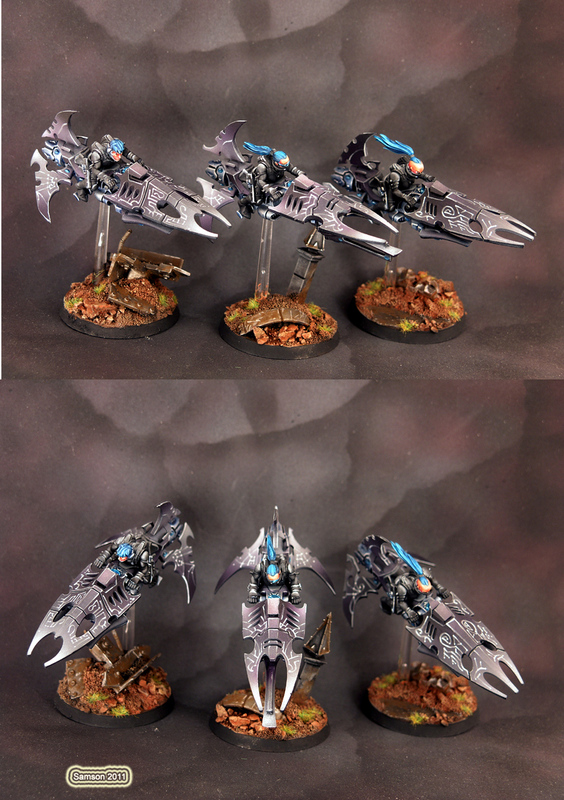 Kevin was undecided about what his list would be exactly before the tournament so had me paint up a few options which is why I say these bikes may be at Adepticon. The commission was for 6 bikes, 6 War Walkers, and 10 Dire Avengers. 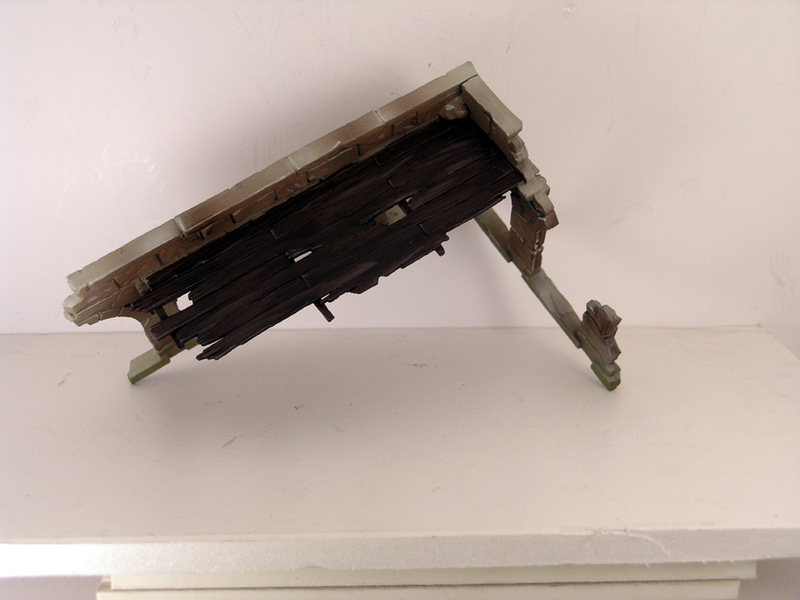 Oh and a display base for the whole force. At this moment all the bikes and walkers are done. All my efforts are on the avengers which are coming along nicely at the moment. Tomorrow I will roll out of bed and finish this baby, followed by a long photography session so I can present all the personnel in their stardusted glory. 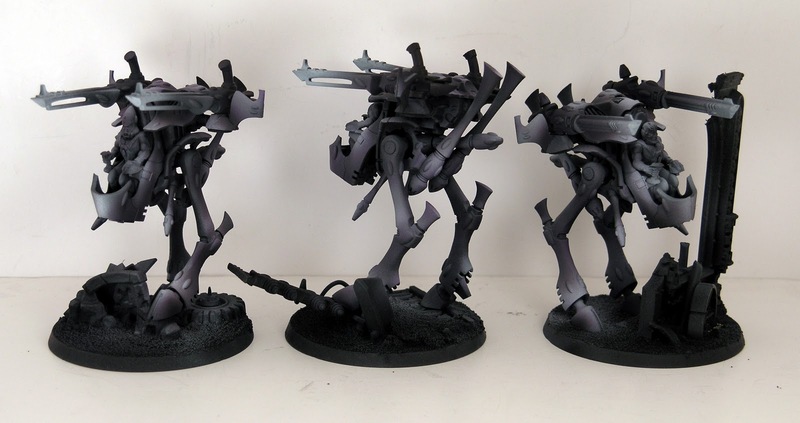 The idea for the overall look on this army was to make them look very foreign to their environment. I chose dusty clay bases punctuated by rusted bits of our human technology and smooth cool celestial colors on the models. This piece kicks off a lasting relationship between the Chimera Hobby Shop and I. 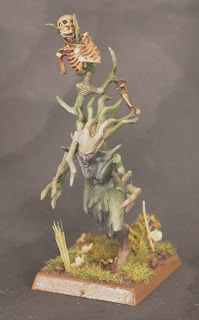 It was fun to do something from lord of the rings as a first, this is actually the first lord of the rings model I've painted. 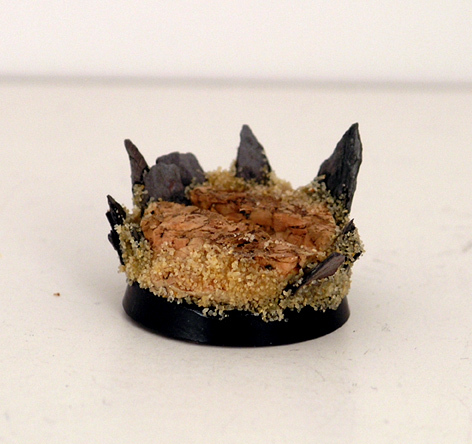 Tonally I kept it to a sandy burnt marshmallow tone much akin to the Deathwing I've painted. 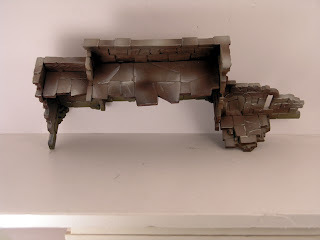 A thin layer of green followed by some chestnut brown was added to the lower edge of these pieces to add a bit of a mossy look. These were some cool pieces and I look forward to seeing them at a tournament. Here are some top views. I've also completed and mailed out another Astorath the Grim. This one is going to my new pal Christophe in Switzerland. Fun Fun! Hopefully he arrives in one piece. He's sufficiently pinned but this is the first international shipment I've sent and I naturally fear the worst. For grins here's my band. what does it have to do with miniatures?..I'm in the band. The drummer if you're curious, enjoy. *warning* this is very radio friendly. Thanks to Christope in Switzerland I've been working on another dark version of Astorath the Grim. I decided to take more pictures this time around. Here's the airbrush work from layer one to 4. The first layer was an even coat of dark grey, next I sprayed in some shadows and shadow grey highlights. I followed with some grey highlights. Next I re-applied some of the blue shadows followed by some white highlighting. It took much longer to paint and photograph all of this than it takes to read it. Here's an in progress shot of some of the early brushwork. Just finished off this guy last night, yet another chaplain for the bidders of Ebay. It's pretty easy to convert chaplains, the only hard part is figuring out what to do for the head. The last one was done by trimming down a berzerker helmet. 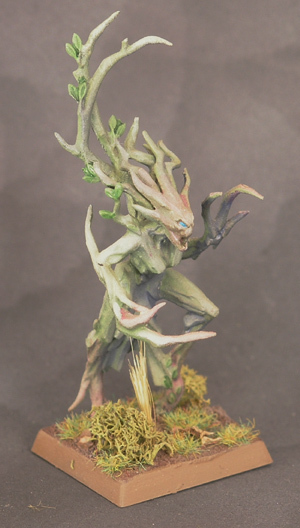 I have to thank Alan for the idea on this one, my sculpting came out ok. Good enough to paint up. 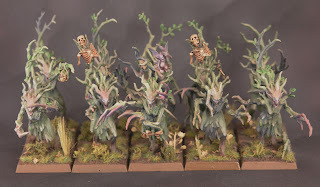 I also dug out a unit I painted a while ago and threw them on Ebay for grins. As I understand it Dryads aren't what they used to be. We'll see what happens with them. 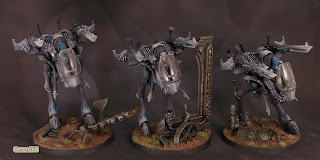 They were really fun to paint and were one of my earlier airbrushing experiments. 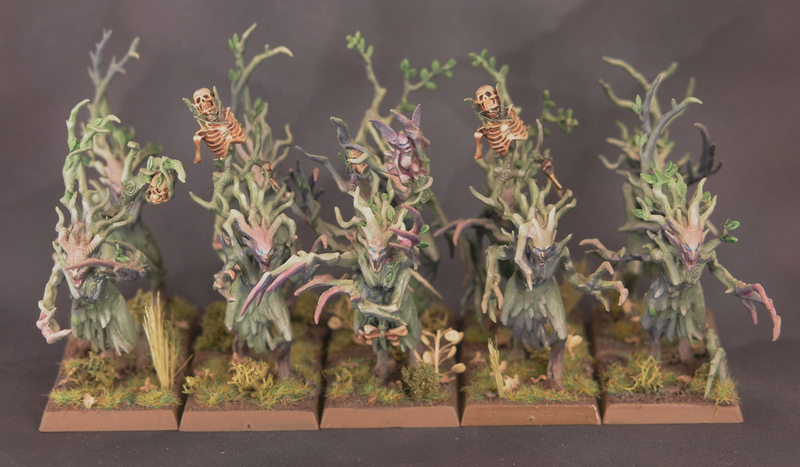 I've also been chipping away at my Adepticon entries, Sophie being the one on the end of the brush. Here's what she's been up to. She's probably one of the smoothest models I've painted to date which makes me happy. I can tell she's going to be a little camera shy as she appears to have come out somewhat glossy. I'll be posting more as she progesses. 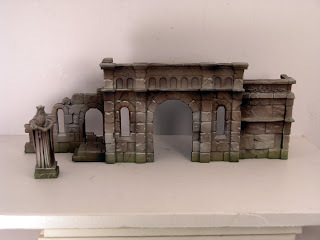 I'm also happy to say I've landed a pretty sweet gig painting scenery for my local hobby shop. So get ready to see more terrain around here. First up will be the ruins of Osgiliath but more on that later. 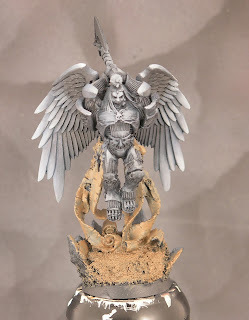 So I've been commissioned to paint another Astorath the Grim. 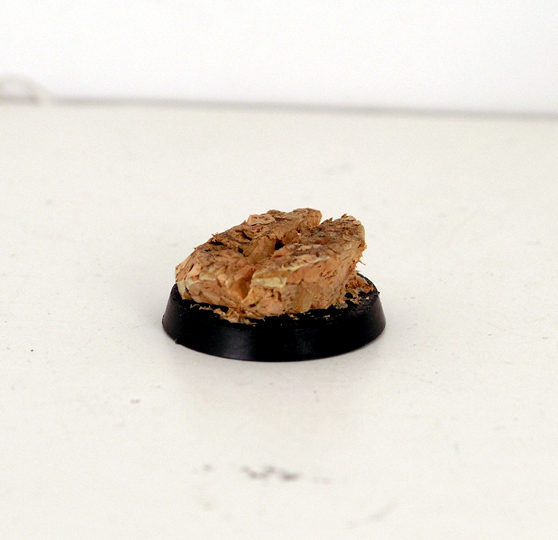 In an effort to get more tutorials up here I took some step by step pictures of how I built his base. I started by cutting a small portion off the cork and glued it to the base. I also found the luckiest nickel that would fall into my hand out of the change jar to add some weight to the base as Astorath is somewhat top heavy. After carving away the slot on the bottom of the base some glue was applied and the piece was set to dry. 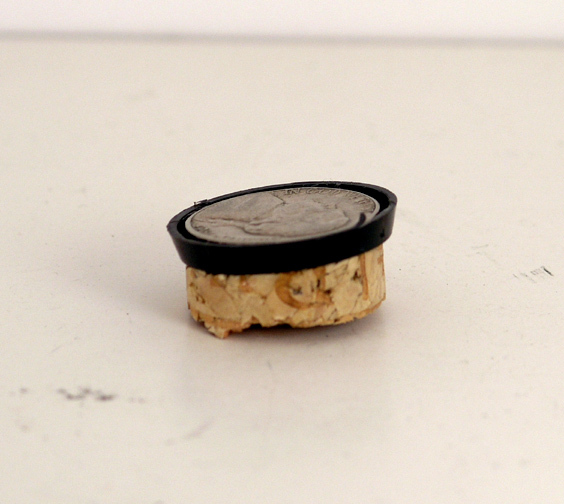 Once dry I carved away some cork at a 45 degree angle and carved out a space for the tab on the model. 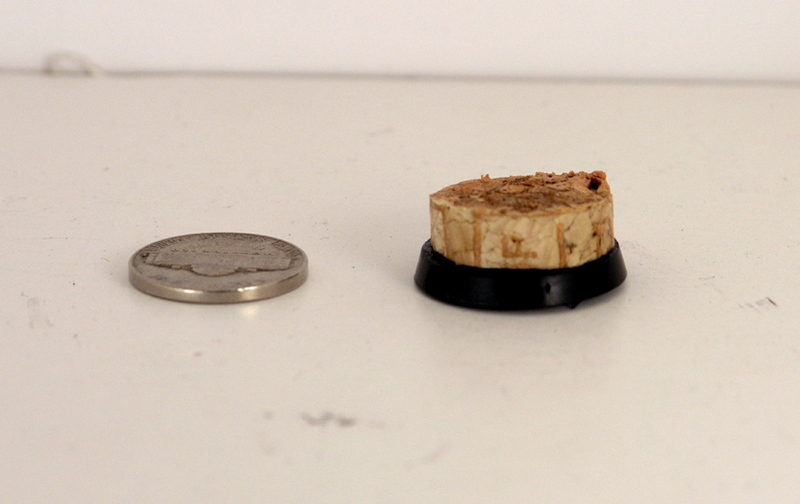 Alternatively I could have pinned the model to the cork but it makes no difference in this situation. Pretty huh? Next I carefully selected some slate I smashed to pieces with my fists and hard stares. If you're not awesome enough a hammer works too. The triangular shapes were glued in place and the piece is starting to come together. Last I glued some sand in place. It's winter here and driveway dirt is scarce, I'd prefer driveway dirt but I doubt the sand will affect the final product. Looks like it's ready for a model. 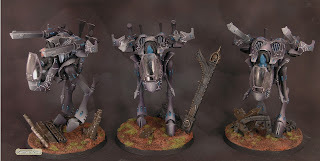 I like the effect this technique has on top heavy models, it creates somewhat of a cone or V shape with most models which creates a nice flow with winged models or minis with both arms raised to the sky. Like a manowar album cover. 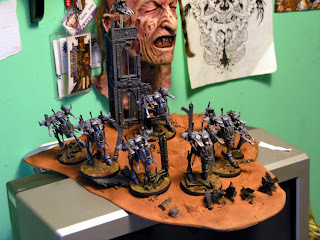 My friend Kevin commissioned me to paint the army he's taking to the combat patrol tournament at Adepticon. I got around to basecoating them last night and this morning, these photos aren't the best but I was able to get much smoother results with the airbrush by diluting the paint even more than I had before. Certain colors come out chalkier than others, white and ivory being the two I've had the most problems with. It makes sense as these colors have lager particles than most. Here they are so far. Now it's on to the brushwork, some edge highlighting and then grey and white freehanding everywhere. I may even use some turquoise in the linework but I plan on coloring all the gems with turquoise and that may be an over load. 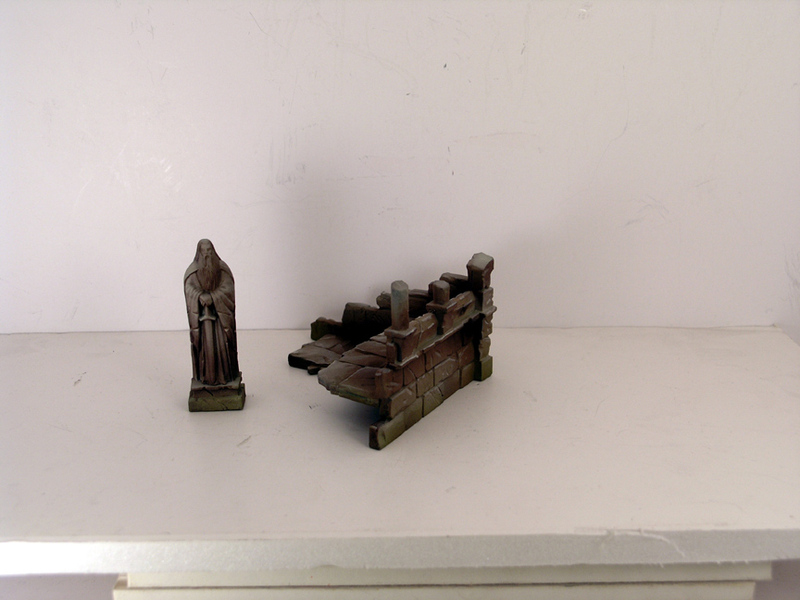 After consulting the color wheel I'm thinking a terracotta color on the bases and buildings. 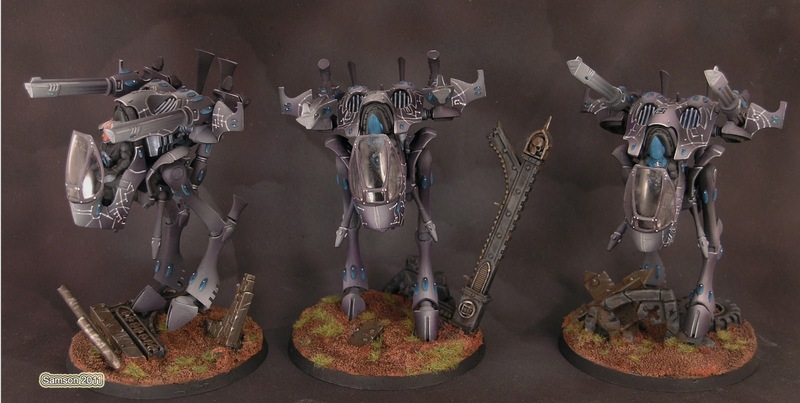 I'm not sure about the pilots, probably something dark with a colored helmet to match the base. 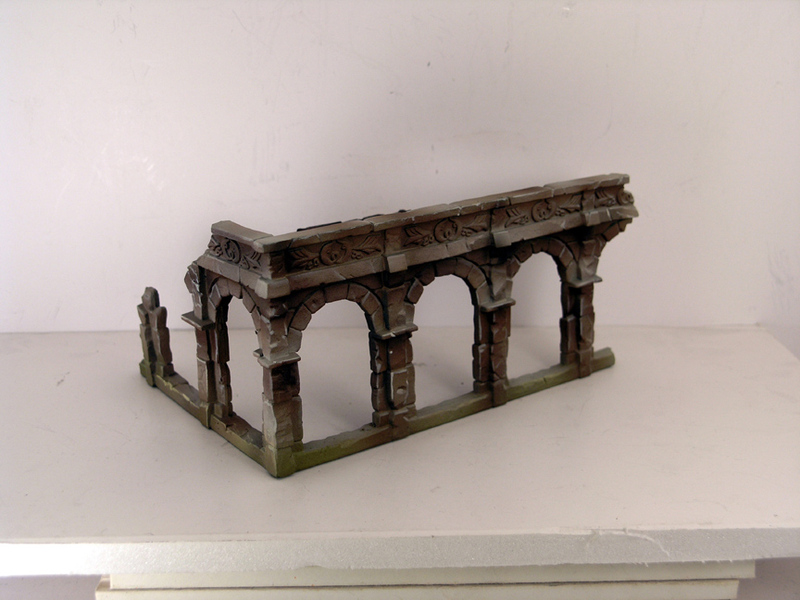 Much like the colors between the model and base shown here. 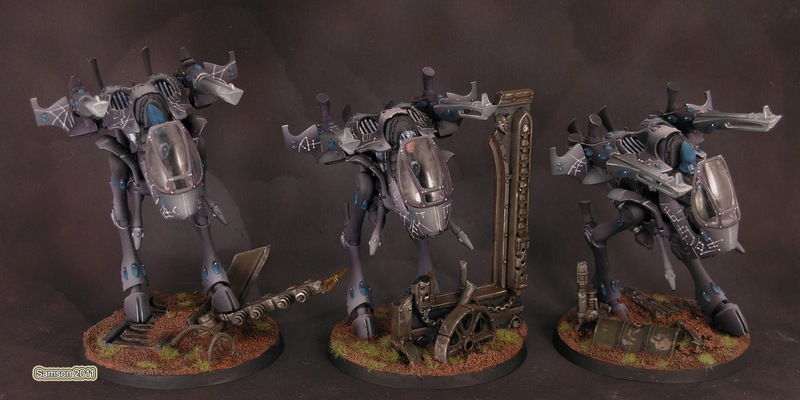 This is the Sophie I plan on taking to Adepticon, I'm thinking true metallics will better suit this model. Apologines for the quality of the photos, they were simply autoleveled. But she's coming along nicely, I still can't quite decide what to do, if any, as far as freehandding goes. Maybe a big tribal tattoo going up and down one leg? 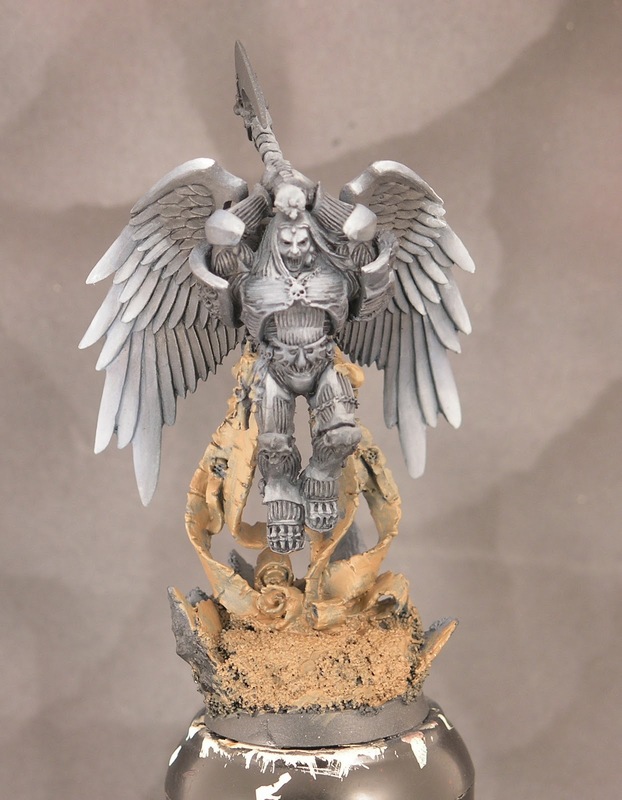 Or some arcane markings on the wings or the rocks on the base? If anyone has any ideas don't hold back. Hopefully I'll have her finished by the end of the week so I can start the beastmen next. Well, I better get back to work!